Have you ever thought about walking into a freshly cleaned home that was completely taken care of by cleaning professionals? Better yet, instead of putting all of your valuable time and effort into cleaning and home upkeep you are able to spend your time with your family, enjoying the outdoors or even catching a good movie. 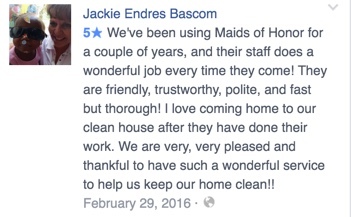 Maids of Honor is a cleaning company, located in Prairie Du Sac Wisconsin, who has provided cleaning services throughout the area over the past 7 years. With a focus on quality work and unmatched service, our team of cleaning pros has handled cleaning jobs throughout the area. Although Sauk Prairie is our home, we offer services to many locations around the region. We understand that trust is an important part of our relationship. We are fully insured and provide a satisfaction guarantee to ensure your happiness. When you are looking for a professional cleaning company in Wisconsin, we would love the opportunity to serve you. Call us for a free consultation and quote.